L-Bar sealers are a great option for centerfold shrink film packaging. They allow users to seal multiple sides of shrink film in one motion. They are more efficient and practical for centerfold shrink film than I-bar sealers or impulse sealers. We offer several combo L-Bar systems that include a shrink tunnel, conveyor belts, and L-bar sealers. All-in-one sealer and shrink chamber combos are a great option for companies to consider when doing a medium amount of output. Shrink wrap sealer and chamber combos allow users to place products inside the centerfold shrink film, close the lid, then seal and shrink the package in one motion. We offer different models with different sizes of shrink chambers. All models include a magnetic hold down feature that allows the operator to simply lower the lid and the shrink chamber does the rest. 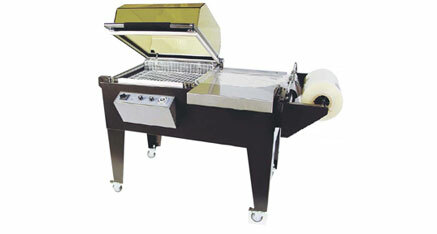 Models also offer an adjustable steel grate to fit larger products into the chamber as needed. A shrink roll holder is included that allows easy dispensing of centerfold rolls. Call us at 1-800-441-5090 if you have any questions about our shrink chambers. NextWhat Heat Shrink Wrap To Use?